The Hierophant (originally The Pope) is the card symbolizing religion, moral laws and traditional values. 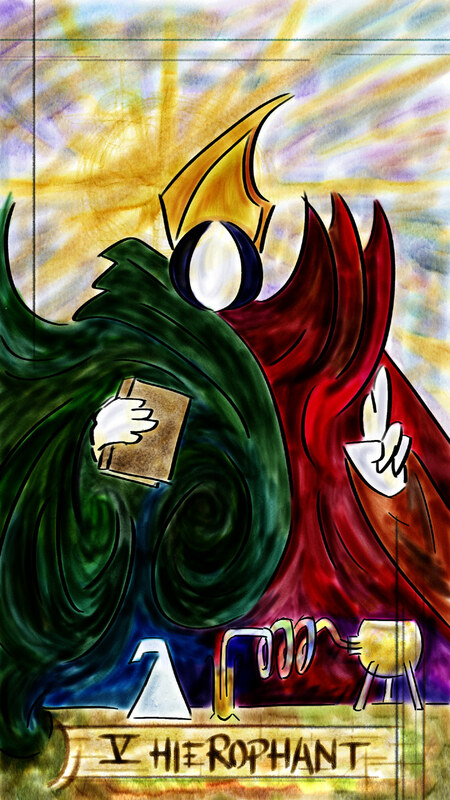 The Hierophant is Key 5 of the Major Arcana. Five represents the essence of things as they are – consider the word “quintessence” from the Latin words for five and nature. It is also the number of the senses; sight, hearing, taste, feeling, smell. The Hierophant stands athwart the world of the senses and the world of meaning. Some authorities say that the Hierophant generally represents assistance, friendship, good advice, alliances (including marriages), and religious interests. Others say that it represents the first level of understanding. When it appears in a tarot spread, it is a warning to the Querant to reexamine his or her understanding of the meaning of things; of the structure of the world; of the powers that be.